It’s the first full weekend in April (Sat-Sun) and that means it’s time to go fishing – for trout and money prizes! 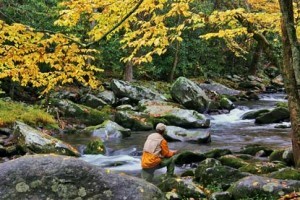 It’s the Smoky Mountain Trout Tournament held in the best fishing spots in the Gatlinburg and Pigeon Forge area. This is the 15th year of the popular event, comprising this Spring tournament and a Fall tournament in September. 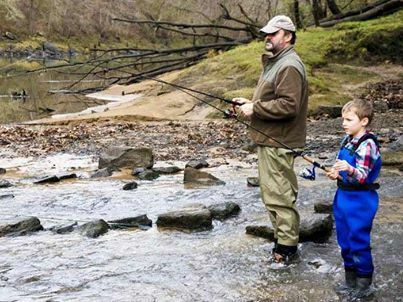 Each year there are more than 10,000 trout stocked in over 20 miles of local streams for these 2-day events, worth over $10,000 in cash and prizes! There’s a prize for Smallest Trout, as well as largest, with numerous shades in between, so the event is truly for the whole family. A fishing license is required, and State and local fishing rules do apply. For details see the Trout Tournament web site. With mountain topography and abundant rainfall, the unique biosphere of the Smoky Mountains is also an excellent habitat for freshwater life. Great Smoky Mountains National Park alone has over 2,100 miles of streams. The Park holds one of the last wild trout habitats in the eastern United States, and also offers a great variety of different angling opportunities, from headwater trout streams to large, cool water smallmouth bass streams. Find out more, including times and requirements, at our Fishing in Great Smoky Mountains National Park feature page.